The MacLarens knew that something was wrong with their full-of-life Labrador retriever when he didn’t want to play ball as usual and there seemed to be a slight limp to his walk. At first, the family thought some arthritis might be the cause. 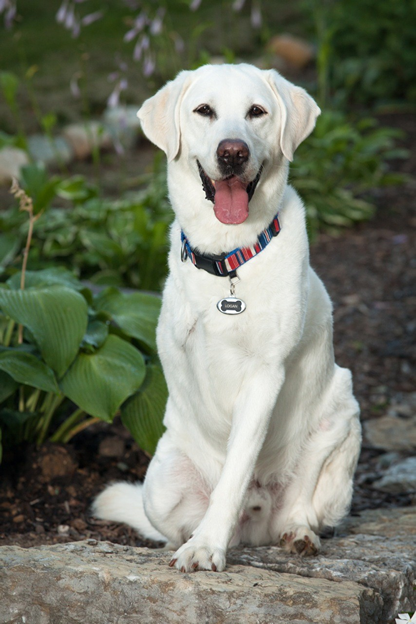 After following up with their local veterinarian, the MacLarens were referred to the Purdue University Veterinary Teaching Hospital, where Logan was diagnosed with a soft tissue sarcoma in his right axilla (armpit). The MacLarens were faced with the difficult and somewhat overwhelming treatment options which would give Logan the best quality of life with minimal pain. After much researching and consultation with the Purdue veterinary staff, the family decided to have Logan’s leg amputated followed by radiation therapy. Logan has fully recovered and has been cancer-free for two years. The MacLarens' message to others facing the same agonizing choices is consider amputation/radiation as an option. Amputation did not mean a diminished quality of life for Logan. It actually meant the opposite- a renewed life free from the progression of disease. The MacLarens also learned that many of their cancer treatment fears were human emotion based and were unfounded in their dog. Logan adapted quickly to amputation with no change to Logan’s vibrant personality. “The staff at Purdue did an excellent job with pain management and at no time did we feel Logan was suffering in pain after amputation and/or radiation”. Within 3 days after amputation, Logan was adjusting to a new center of gravity and walking with confidence at home. During radiation treatments, Logan came home each day and played catch in our backyard for a bit. Amputation and radiation gave Logan the gift of an extended, good quality of life. The MacLaren family is so grateful for the exceptional care they received from everyone at the Purdue University Veterinary Teaching Hospital. Their hope in sharing Logan’s story is to let people know that there is always an option – “even when it seems like all the odds are against you, there is always hope.” This is a beautiful example of the human-animal bond and the special relationship the MacLarens have with their dog, Logan. “We learned so much from Logan and his resiliency that we are glad we fought the cancer at Purdue University Veterinary Teaching Hospital. We think Logan is happy with that decision too."